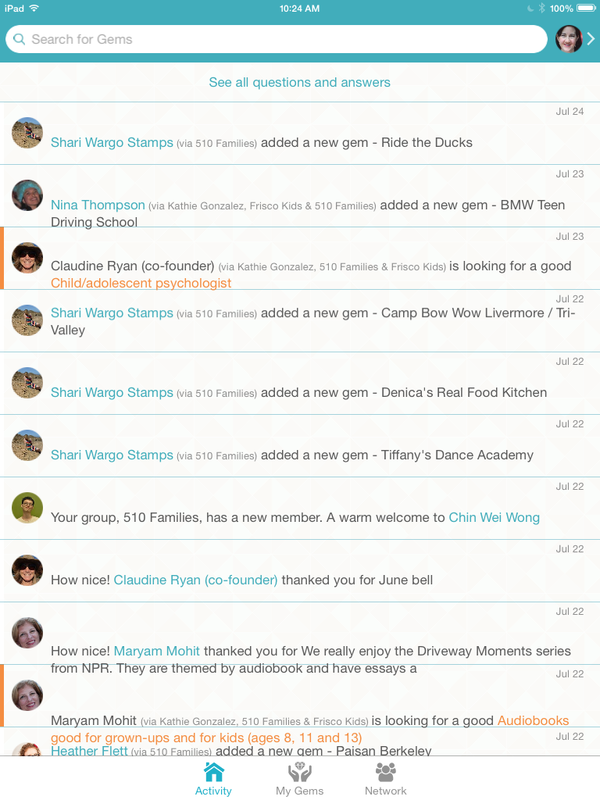 Frisco Kids: Review: GemShare Site to Share Referrals/Recommendations - Free! Review: GemShare Site to Share Referrals/Recommendations - Free! Whether you’re new to a Bay Area community (or anywhere, for that matter) or you’ve been living here awhile, sometimes it’s tough to find the referrals you need. You might need a new hairdresser, roofer, camp, orthodontist, pediatrician, massage therapist, tutor, lawyer, restaurant party location etc. Two San Francisco moms started GemShare, which I see as a combination of Angie’s List, Yelp and your favorite Facebook (or email) group that shares referrals. Angie’s List costs money and you don’t know the people giving referrals. With Yelp you also don’t know the referrers and you don’t know if the reviews are legitimate. And with your Facebook group or email, you often know the people, but it’s hard to sort and store the referrals for when you need them. GemShare is free and you can see who wrote each review – the site strongly encourages members to use their full name and picture (and from what I've seen, most people comply). Each piece of advice/referral is a “gem,” hence the name. GemShare contacted us for a sponsored review of their site and to start a Frisco Kids group – which we thought was an excellent community-building thing to do. Please join us on GemShare in the Frisco Kids group! I’ll tell you how here, and I’ll explain more about our review of GemShare below. 1. Download GemShare (free) in iTunes. You have to have an iPad or iPhone; unfortunately it’s not on Android. You can decide whether to connect through an email account or through Facebook. Enter your basic information including your name, password and optional photo (you can take one from your device or use one from your gallery – just click on “choose” on the top right corner of the photo if you take one – the choose word is hard to see. Otherwise they give you the monkey one below). After you’re in, go to “Network” at the bottom, and click on that. (In the picture below you can see the three options at the bottom: Activity, My Gems and Network). 2. After clicking on Network, you'll see a page like the one above. The circle for “Groups” in the right side of the baseball diamond. Click on that and browse groups in your area. You can click on “current location” or type in your location, like San Francisco or San Mateo. 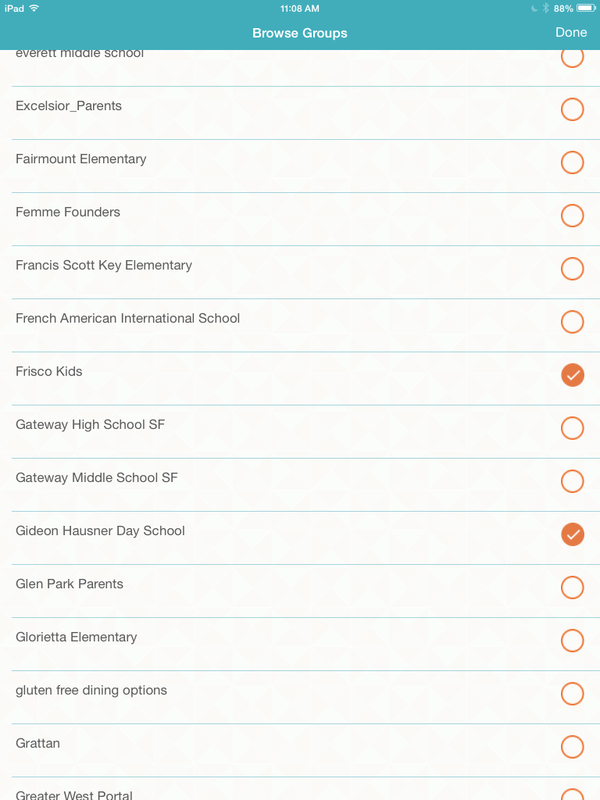 Look for Frisco Kids (the list is alphabetical) and click on it to join the group. At the top of that screen, you’ll then click “done.” Now you’re in our group! 3. I’ve been playing around with the site – a little harder to do since I have only one friend so far (sad face). I feel lonely! Please be my friend on GemShare! You can search for friends by name (I’m under Debbie Kaplan), email address, those in your address book, Gmail or Facebook, and you can invite your friends that way as well. Joining groups (like Frisco Kids) broadens your network and gives you access to more gems and people who can answer your request for gems. In terms of finding gems, you go to “My Gems” section and you’re allowed to ask for a gem (a recommendation), add one of your own or browse gems. If you want to add some directly from your phone contact list you can do that too (they promise not to spam your contact list). A partial list of groups you can join in the Bay Area, in alphabetical order. To find like-minded groups to join, type in a location or use your current location. You can join or start a group for almost anything – your mothers’ group, school, neighborhood, fitness, child’s age group, single parents, gluten-free families, etc. You don’t have to belong to just one group, but for now you can join a max of 5 groups. They plan to add private group functionality later. One quirk I found is that if I didn’t click on “current location,” my prefilled slot said “nearest to Krasnodon.” I had to look that one up. It’s in Russia. Not sure what that’s all about. A list of gem categories you can look through if you don't want to do a search. This one is for fitness. When you’re looking for gems, you can search by location or by connection. The first day I signed up, the site looked kind of empty. When I went on a day later, there was a lot of activity. So don't give up if you sign on and don't see much. You need to get populated with groups and friends, so join groups! You need to build up your network. Searching gems by your connection. This is someone who is in the same group as me. You can see all the gems she added. One frustrating thing I found was that in all the categories listed (like in the screenshot above), it didn’t tell you which contained gems and which didn’t, so I had to manually search each category to see what it looked like. If you use the search function, though, you’ll have better luck. Searching was able to yield results. When you sign up you can set your email preferences to get questions from friends, to get a digest, and other notifications. Please join me on GemShare. Get to know how it works by adding at least three gems to share your knowledge of the best vendors in the Bay Area. Thank you to GemShare for sponsoring this post.